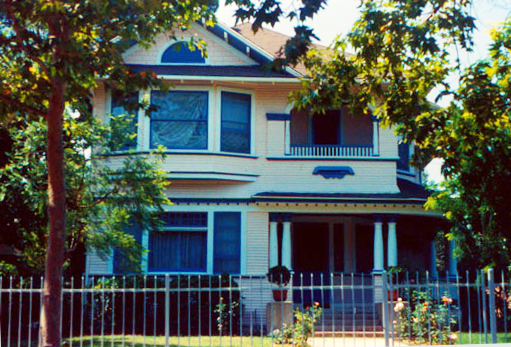 Built in 1903, and moved to its current location in 1914, the G. W. E. Griffith House is a good example of American Foursquare, and features Islamic arches in the two balconies. Though no architect is noted on the permit, the design is attributed to architect Fred R. Dorn who designed several other homes for Mary Osmond, the widowed daughter of local banker George Washington Ewing Griffith. Griffith, who lived 99 years, was born in a log cabin six miles north of Lafayette, Indiana on December 22, 1833. He settled in Kansas after attending college in Pennsylvania eventually making a sizeable sum in various businesses, including banking. In his autobiography, published at the age of 96, Griffith recites a vivid recollection of historic events including the Civil War raid on Lawrence Kansas (where he lived at the time) by William Clarke Quantrell’s ‘Gang of Missouri Bushwhackers.’ After “retiring” to Los Angeles at the turn of the 20th Century, Griffith founded several banks including the Highland Park Bank and the South Pasadena Bank.